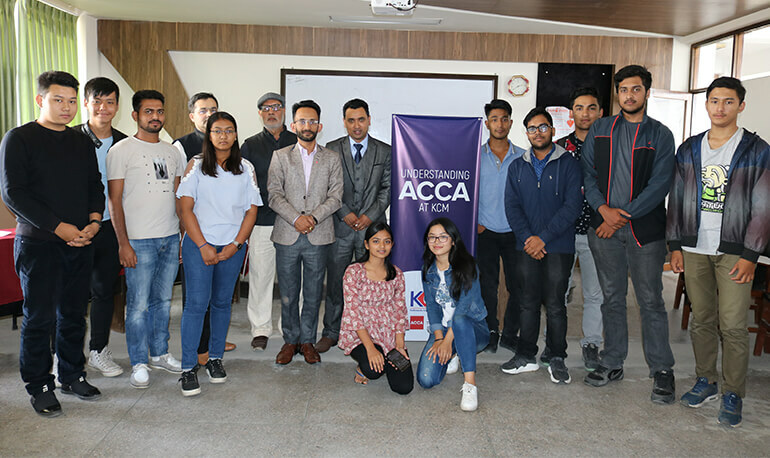 “Understanding ACCA at KCM” was a fruitful event organized jointly by ACCA Nepal and KCM. The event aimed to introduce ACCA program to students. Mr. Rabin Katwal, Head of ACCA Nepal, was the lead speaker in the event. He spoke on the ACCA program contents, career implication, and special pathway for KCM students. Mr. Bishnu Raj Adhikari, Principal of KCM, spoke on the experience of KCM and ACCA partnership.Mr. Sudev Shah, BBA student at KCM, shared his experience as a KCM student and ACCA candidate. Chief Operating Officer at NLIC, Mr. Pawan Kumar Khadka, shared his experience as an ACCA member. The program ended with concluding remarks from Prof. Dr. Pushpa Raj Adhikari, Academic Director at KCM and Mr. Sitaram Dhakal, Faculty of Finance at KCM.